Cinco de Mayo ranks right up there in holiday food with Thanksgiving. Frankly, we frequently have Southwestern Thanksgiving's complete with a Cinco do Mayo flair in place of total tradition. Who says margaritas don't go with turkey?? My real celebration though, usually begins on Tres de Mayo. You see, some 21 years ago I met my husband on Tres de Mayo, yes, in a Mexican restaurant. Who knew that the chance encounter with me living in Northern California and he in the Air Force, based in Enid, OK, would lead to the lives we live together today? Somehow we breached those many miles between us and it was meant to be. Lower in fat cream cheese provides a rich, creamy base that doesn't at all suffer in either taste or texture from the loss of those unneeded calories. Light sour cream and a generous helping of Margarita "fixn's" - lime, tequila and my beloved Grand Marnier - complete the package bringing a light yet brimming with flavor, creamy confection to your celebration. Oft requested, this is one of those desserts that ranks up there with our all time favorites. A staple for summer picnics or a bright treat in mid winter, it is worthy of any special occasion. Position rack in center of oven and preheat to 350°F. Spray 9-inch springform pan with 2 3/4-inch-high sides with vegetable oil spray. Mix graham cracker or cookie crumbs, sugar and butter in medium bowl until blended. Press crumbs over bottom and 1 inch up sides of prepared pan. Refrigerate crust. Using electric mixer, beat cheese in large bowl until fluffy. Beat in sour cream, then sugar, triple sec, tequila and lime juice. Beat in eggs. Whisk sour cream, lime juice, lime peel and sugar in small bowl to blend. Spread evenly over cheesecake. Return cheesecake to hot oven. Let stand 45 minutes or less (Cheesecake will look very soft, but will set up when chilled.) Refrigerate cake until well chilled, up to 1 day. Note: Lately I've joined the "single serving craze" and have been baking these into individual serving sizes using a mini cheesecake pan . This has worked so well for larger events, what a treat not to have to cut the cake! Yep... it was that good!! I think I need to make this...I have a bottle of tequila in the kitchen for once (from one of Michael's clients)! This looks so wonderful and springy!! Oh, this is amazing. It even looks better than Margarita Cupcakes! I have to make this. Don't you just love TJ's, who knew Kitty Cat in the crust. You have spoken to my heart with this recipe. You know how much I love cheesecake and citrus. Did you do this just for me? Is it my birthday present? I am so happy to see this. Bookmarked. Though not for long. I'll be making it soon. Very soon. Holy cow. Yes! I will take a slice of this now and another on Cinco de Mayo! Along with my margarita! Kim, this is what dreams are made of. Speaking of which, this is a lovely post to end the day: fluffy lime, margarita on a crunchy pillow base with tons of sunshine and happy moments! Cheers. Ooooh, this looks so delicious and refreshing! I would love to have a piece right now. What a beautiful perfect cheesecake too! That looks amazing. My hubbie loves Cheesecake so this might be a feature dish at his birthday later this month! Fantastic cheesecake! Clever and boozy, just can't go wrong :) Neat story about you and your hubz too, thanks for sharing! Aww what a lovely story. The presentation is appealing that I wish you lived next door,so that I could hop in and sample one of the pieces. Wishing you and your husband a beautiful life around cheesecakes and margaritas. Okay, I am in love. I buzzed instantly, I just think these sound so good. Love that you and your hubby start celebrating Cinco de Mayo early...too sweet! Love those single-serving cakes; they're adorable (and so well portioned, of course)! Also, my anniversary with my boyfriend is actually Cinco de Mayo exactly, though we did not meet in a mexican restaurant (which is great story :D). I adore a love story of how food and beverage brings people together...my wife and I met under similar circumstances. I'm delighted our favorite blog portal is back on line to give this gorgeous post the buzz love it deserves. Congratulations on the Top 9! I wish I could eat a piece right now! It sounds wonderful. And I love the mini-cheesecake versions. Congrats on making top 9, my friend!! What a wonderful flavor for a cheesecake. Delicious. It looks like it would burst with flavor. Ok... anything that says "margarita" and "cheesecake" (two of my favorite things in the world) has to be nothing short of incredible. This is fantastic! Congrats on making the Top 9 today! Happy Cinco de Mayo to you too, Kim. 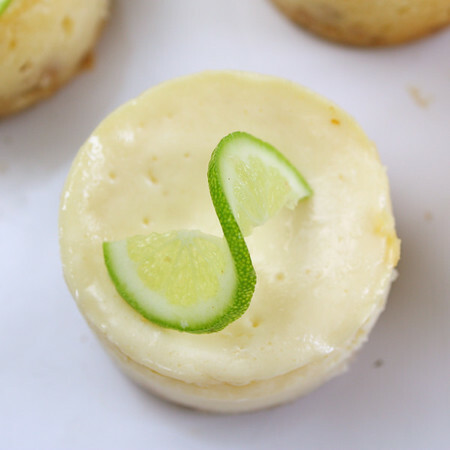 Love the idea of smaller cheesecakes! Congrats on another great post! Love the addition of the empty plate at the end, both clever and cute. OK, you've just inspired me to create a celebration tomorrow. This cheesecake looks lighter and fluffier than most. This appeals to me. Congrats on making the Top 9! Looks yummy! I love sweets. I also enjoy baking. I am going to follow you! Happy Cinco de Mayo to you Kim! Yum! Perfect for summer. I can almost taste the tartness goodness from your pictures! Good job! Happy Cinco de Mayo,for sure!! I'd eat this until I went blue in the face!! I love how your cheesecake looks in mini! This sounds so delicious! Definitely saving this to make it. 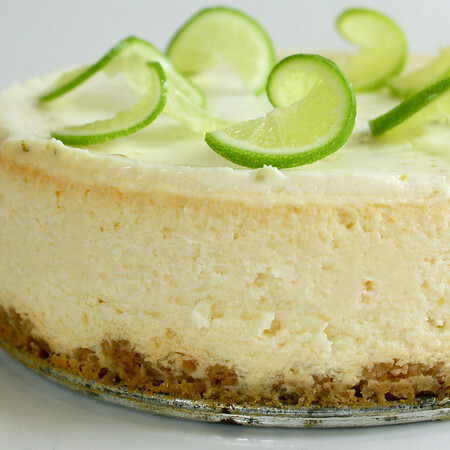 What a gorgeous cheesecake, and a perfect Cinco (or tres) de Mayo dessert! Is there a way to print this without printing all the comments - side bars etc. Trying not to kill a tree - and this looks sooooo good! this is a spectacular cheesecake, looks scrumptious. This looks so refreshing on our first 90 degree day of the season. Congrats on another Top 9! Awww it really seems like you guys were meant for each other. And this cheesecake is meant to be made soon in my kitchen! Congratulations on this wonderful top 9! Cheesecake's a favorite -- usually my birthday "cake" and this version sounds fabulous. Happy Anniversary! I think my nephew is stationed at that airforce base in OK. Small world. Your recipe is a nice starting point for me, but my idea of "living life to its fullest" does not include reduced-fat cream cheese and light sour cream. It also does not include a cup of sugar. I prefer natural dairy products and natural sweeteners, both for taste and health, so I'll modify your recipe a little. As it stands, the healthy aspects of the butter, eggs, booze and lime make your recipe a great starting point! Jim, I get it!!! We've made this cake with regular cream cheese and sour cream and it's just as, if not even more, wonderful! You will love it. Let me know what you think when you try it! Thanks so much for the comment! How did I miss this beauty??? How gorgeous AND delicious! This sounds absolutely amazing! 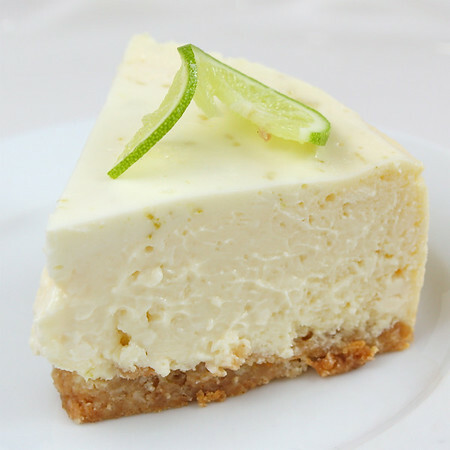 What a great flavor combination for a cheesecake, so refreshing and perfect for Cinco de Mayo! Congrats on the top 9! I love Cinco de Mayo love stories and this cheesecake! This will be making multiple appearances in my summer, I am sure. I could only imagine it was that good! Just wanted to with you a Very Happy Mother's Day! I've had this post in my foodbuzz inbox and saved it to comment. This looks absolutely DELISH and I have to make this for my family. Our issue is we are all trying to eat light and cut sugars but I have to make an exception for this. 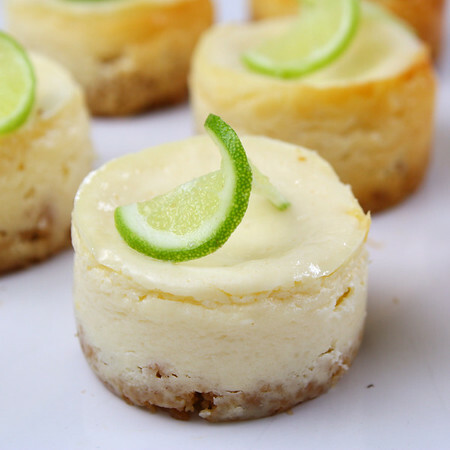 I love cheesecake and the margarita touch makes these irresistible. Such a great dessert to celebrate your first meeting anniversary. this. looks. outstanding. I am blown away with how light and creamy this looks. I must try!!! and thanks so much for commenting on my summer squash, I actually just made an even better rendition of it in a casserole over arugala salad... delicious! would love to know your changes to make the single serve cheesecakes. I have a mini cheesecake pan and think this would be perfect for my Cinco de Mayo dinner this weekend! Can't wait to try tomorrow for my husbands birthday! I bought all of the ingredients listed but in the directions, triple sec is supposed to be added in, which is not listed above as an ingredient. Will the cake be OK without it or is It necessary to have the triple sec? If so, how much? Thanks so much!! Addonemore, we used Grand Marnier in placeof the Triple Sec... the cake, however would be just fine without either!! I used 3 1/2 Tbs of Grand Marnier in the filling, and if you have it on hand it will make a nice addition. No worries if not, just omit. My increase your lime juice by a Tbs or so. Enjoy! Thank you for an amazing recipe! 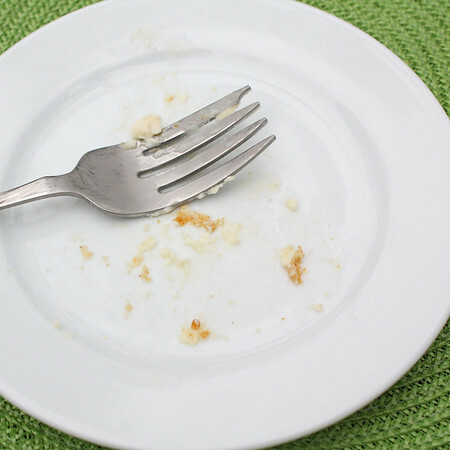 I have to admit I had some definite cracking (this was my first cheesecake... I've read that putting it in a water bath can help?) but it was absolutely delish! I subbed OJ for the grand marnier and just used 2T of tequila. Perfect Cinco De Mayo dessert! !